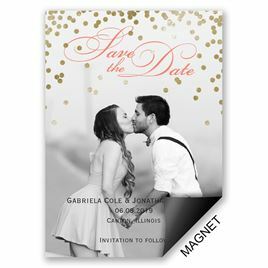 Make your wedding reminders stand out with gold save the dates! Whether you are looking for a classic, elegant style or glam and sparkly, our gold save the date cards will match your theme perfectly! Browse these gold cards and find gold chevron, gold leaves, and floral confetti. Also browse our rustic save the dates and vintage save the dates.